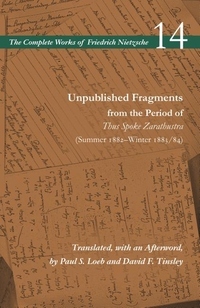 This volume provides the first English translation of Nietzsche's unpublished notebooks from 1882-1884, the period in which he was composing the book that he considered his best and most important work, Thus Spoke Zarathustra. Crucial transitional documents in Nietzsche's intellectual development, the notebooks mark a shift into what is widely regarded as the philosopher's mature period. They reveal his long-term design of a fictional tetralogy charting the philosophical, pedagogical, and psychological journeys of his alter-ego, Zarathustra. Here, in nuce, appear Zarathustra's teaching about the death of God; his discovery that the secret of life is the will to power; and his most profound and most frightening thought--that his own life, human history, and the entire cosmos will eternally return. During this same period, Nietzsche was also composing preparatory notes for his next book, Beyond Good and Evil, and the notebooks are especially significant for the insight they provide into his evolving theory of drives, his critical ideas about the nature and history of morality, and his initial thoughts on one of his best-known concepts, the superhuman (Übermensch).